Franklin Delano Roosevelt and his family returned to their New York City home at 49 East 65th Street in January 1921 after living in Washington DC for the previous seven years while FDR was Assistant Secretary of the Navy under President Woodrow Wilson. 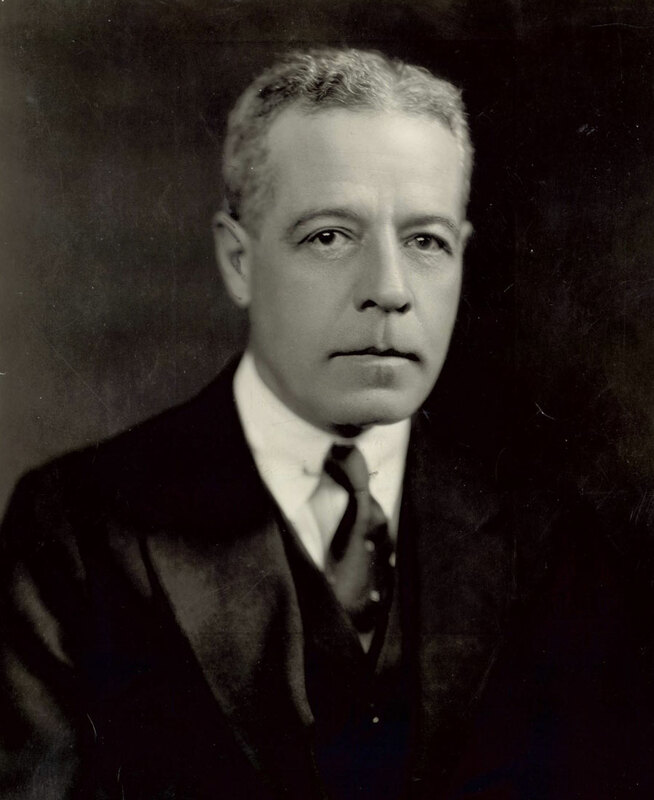 He had resigned that post in the summer of 1920 when he agreed to be the vice presidential candidate on the Democratic ticket to run with James Cox, the presidential nominee. After an arduous campaign, during which time FDR’s speeches were carried on the radio in a pioneering effort, the Democrats lost to Republicans Warren Harding and Calvin Coolidge. Out of office for the first time in a decade, FDR took a job and went to work in Lower Manhattan. 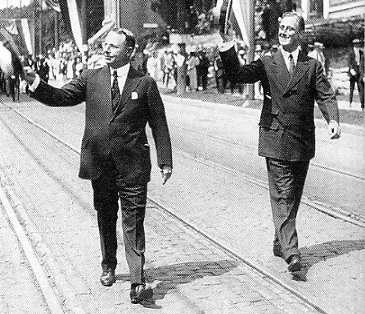 James M. Cox (1870-1957), Governor of Ohio, and Franklin Delano Roosevelt campaigning in 1920. FDR had welcomed the job offered by acquaintance, and fellow sailor, Van Lear Black. Black was a successful Baltimore businessman, newspaper publisher, and Chairman of the Board of the Fidelity and Deposit Company of Maryland. FDR agreed to become a Vice President of Fidelity at its New York City office (in charge of New York, New Jersey and New England) and a member of the Fidelity board, as long as he could split his day. The mornings would be devoted to his law practice and the afternoon hours to Fidelity. The deal was made and FDR’s salary set at $25,000 (approximately $287,000 in at current values). Fidelity’s headquarters was located in the heart of Baltimore’s business district. 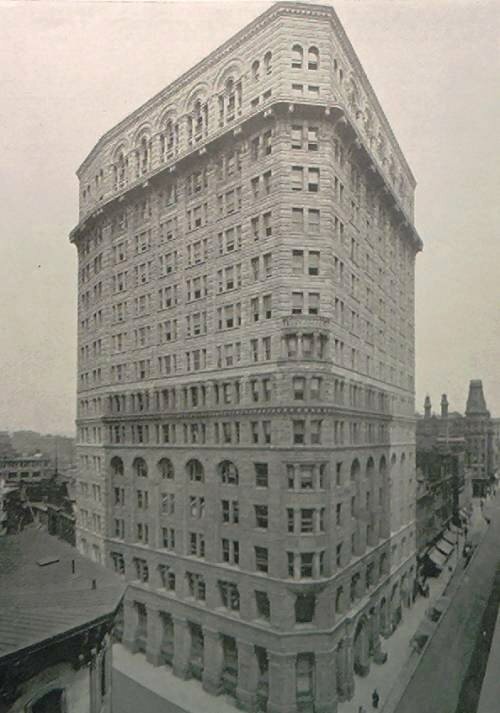 It was so successful that it enlarged its original seven-story building (1893) to fifteen-stories in 1915. Van Lear Black (1875-1930), 1925. Black traced his family to colonial America but his fortune was due to his own efforts, starting work at age 18 with Fidelity and rising through the ranks. Additional investments in coal companies and the publishing company of The Baltimore Sun made him one of the wealthiest persons in Maryland. Fidelity, founded in 1890, was looking to increase its business in New York where it was already one of the four largest insurers in the surety and bond business. As required by New York State, Fidelity and other companies offered insurance (surety bonds) to cover losses if contracts were not fulfilled and fidelity bonds to protect all kinds of for profit and nonprofit organizations against losses incurred by the financial misconduct of employees. Decisions about what company to purchase such insurance from were frequently influenced by personal and political connections. Given FDR’s friendships, networks in business and politics, and experience in government and the military, he was a good choice to help Fidelity grow. Indeed, within a few years Fidelity’s annual income would increase by several million dollars. FDR started at Fidelity in January 1921 in its offices at 120 Broadway. He hired his loyal political advisor and Navy Department assistant Louis Howe to work with him there. This decision would be extremely important some months later when FDR became ill with polio. Roosevelt’s letterhead at Fidelity, 1921. 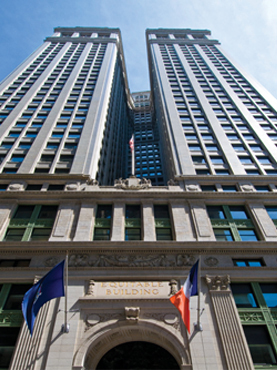 Fidelity’s New York City offices were in the prestigious Equitable Building (1915) at 120 Broadway a few blocks from Wall Street bordered by Broadway and Nassau, Pine and Cedar Streets. With a six-story base and 38 floors above that, it was the largest office building in the world at that time with 1.8 million square feet of space. The Bankers Club was located on the top floor, and major corporations, law firms, and insurance companies also had their offices in the building. Van Lear Black owned a steam-powered yacht, Sabalo, which he sailed from Baltimore to New York at the end of July 1921. FDR came aboard and helped navigate as they sailed to Campobello Island, just off the coast of Eastport, Maine, where the Roosevelts had their summer home. They arrived on August 7 and Black and his party spent two days as guests with the family and Eleanor reported, “We were busy and spent the days on the water fishing and doing all we could to give them a pleasant time.” On August 10, FDR enjoyed a long and strenuous day with his five children, swimming, hiking, and boating, and fell ill in the evening. He had contracted polio at age 39 and would never walk, or play golf, or run with his children again. With the devoted care of his wife Eleanor and Louis Howe, he was stabilized and able to return to New York by train. 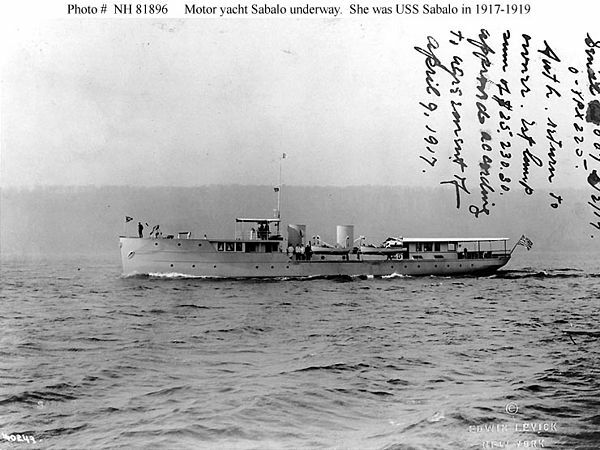 The Sabalo, more than 140 feet long, was built as a private yacht and then used by the Navy in World War I. Returned to civilian life, it was bought by Van Lear Black in 1921. After his death it was sold several times and then acquired by the Canadian Navy during World War II. 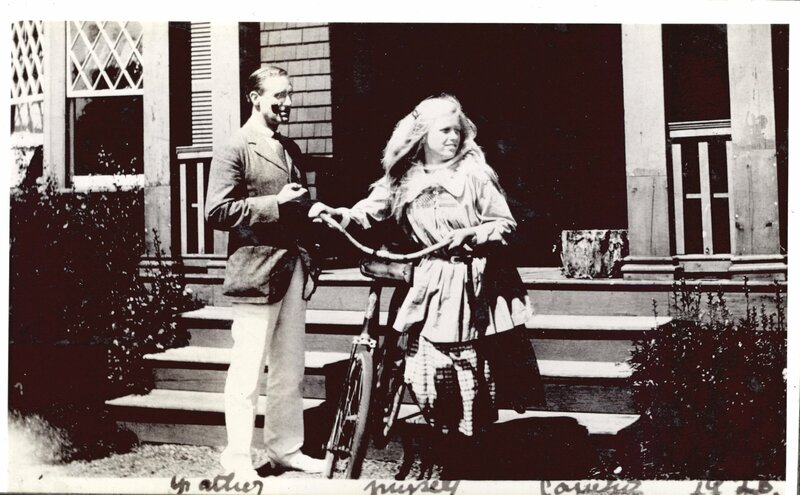 FDR with Anna, his oldest child and only daughter, in 1920, in front of their house on Campobello Island. 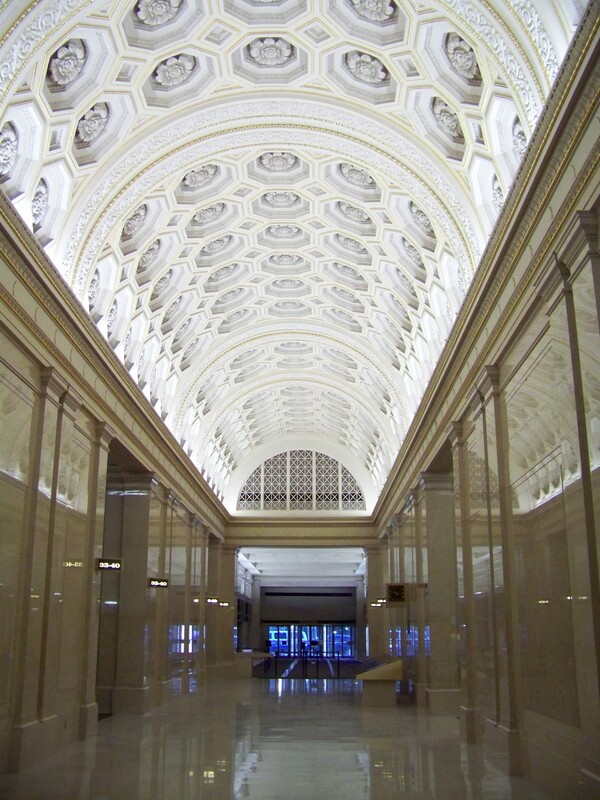 The lobby of 120 Broadway was restored to its original appearance in the late 1980s to highlight its beautifully coffered ceiling and polished marble floors and walls. The Equitable Building is a New York City landmark and also a National Historic Landmark. [FDR Desk picture here]. 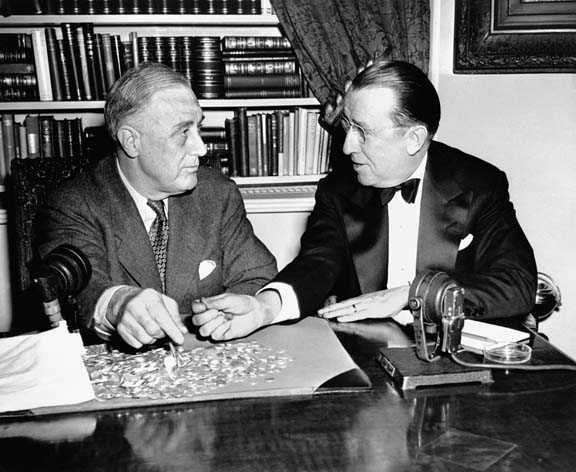 Caption: FDR’s walnut desk was generously sized at 37 by 71 inches. Friends would visit and have lunch with him at his desk so that he could avoid another arduous trip in and out of the building. The desk was refurbished in 2012. Roosevelt with Lewis Etienne O’Brian (1889-1961), 1924. Born in Paris to American parents, Etienne had degrees in chemistry and law. 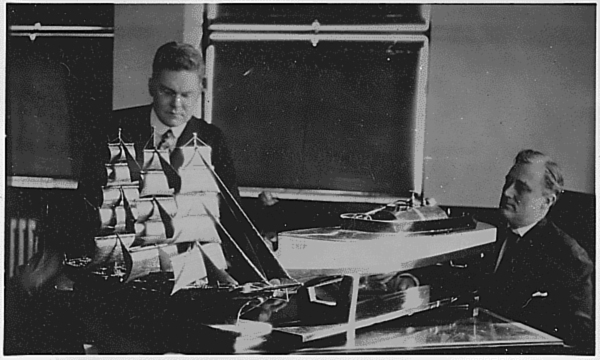 He is shown here with FDR and his model sailboat and O’Brian’s steamboat “Chip,” in the Fidelity offices. 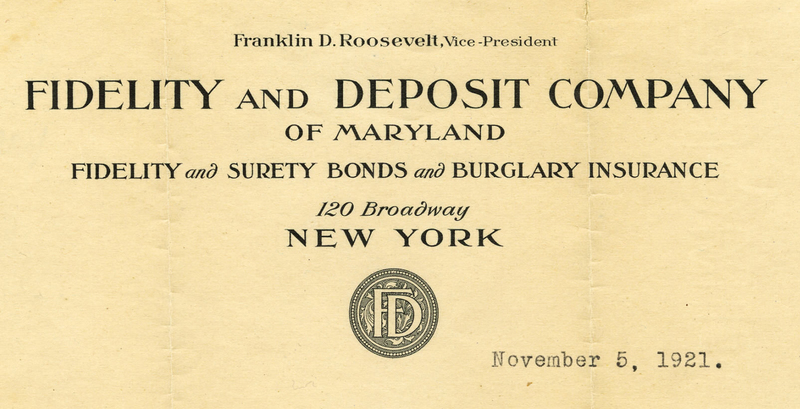 While at Fidelity, FDR was also partner in two law firms. The first, Emmet, Marvin & Roosevelt (1920-24), was located close by at 52 Wall Street but became inaccessible once he had polio and could no longer climb the entrance stairs to the building. His second firm was Roosevelt & O’Connor (1925-1928) whose offices were conveniently on another floor at 120 Broadway. Even with his responsibilities at Fidelity and the law firms, FDR traveled frequently to Warm Springs, GA in the 1920s for therapy in its waters and established a polio treatment center there. Basil O’Connor, a successful corporate lawyer, became a lifelong friend and astute political advisor. He helped FDR buy Warm Springs in 1927, and later assisted FDR in establishing the National Foundation for Infantile Paralysis – known popularly as the March of Dimes – in 1938 to raise money for research to find a cure for polio and to care for those ill with the disease. Roosevelt and Basil O’Connor counting dimes sent in to the White House for the March of Dimes, 1944. FDR re-entered public life in 1924 at the Democratic Convention in New York City when he nominated New York Governor Al Smith to be the presidential candidate. He did this again in 1928 when Smith was finally selected as the nominee. FDR was recruited to run for the governorship and eked out a victory by the small margin of 25,000 votes in November 1928. FDR then resigned from his Fidelity job and his position on the company’s board to avoid any appearance of a conflict of interest. FDR’s work at Fidelity had provided him with business experience and contacts that would be invaluable while he was Governor (1929-1933) and President (1933-1945), dealing with the complex economic issues of the Great Depression and his New Deal Recovery programs. 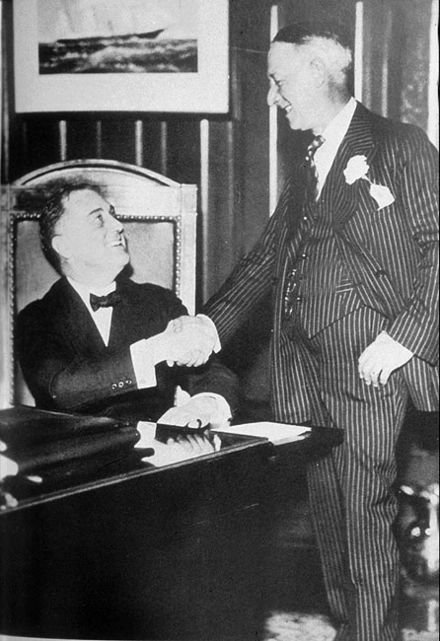 FDR and Al Smith c.1930 in the governor’s office in Albany after Smith had been defeated by the Republican presidential candidate Herbert Hoover in 1928. 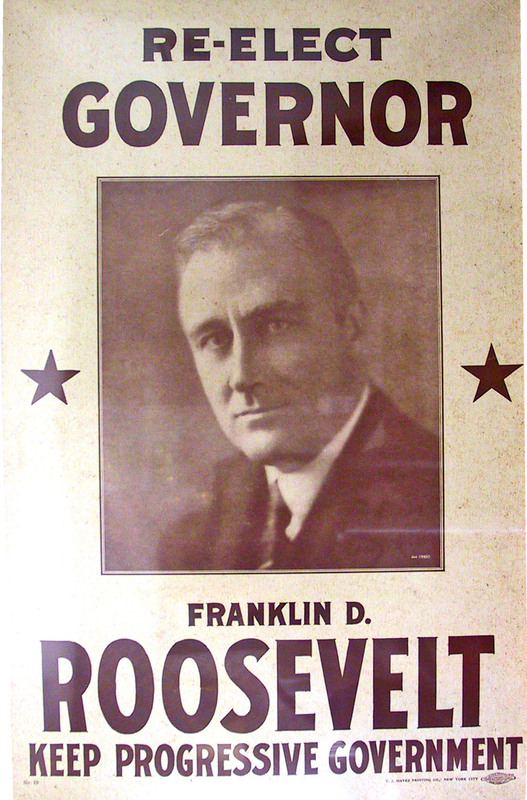 Poster for FDR’s re-election campaign in 1930. As the effects of the Great Depression worsened, he defeated his Republican opponent by a landslide, 1.7 million to 1.0 million votes, which enhanced his standing as a potential presidential candidate. FDR secured the Democratic nomination in 1932 and was elected to his first term as president in November of that year. Although FDR left Fidelity when he became governor, his friendship with Van Lear Black remained strong. FDR had attended a party for Black celebrating his record-breaking round-trip flight from Holland to Batavia (Indonesia) the previous June, some 18,000+ miles and the first international charter flight. Black had become a civil aviation pioneer, buying or renting planes and hiring aviators to fly him over 125,000 miles around Europe and to Asia, Africa, and India in the second half of the 1920s. He also financed flights to the North Pole by Admiral Richard Byrd. 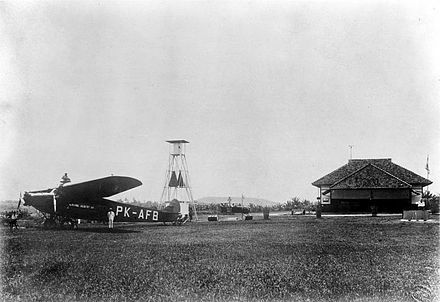 Van Lear Black with his plane in Batavia, 1927, then a Dutch colony. For his achievements, he was honored by the Dutch government. FDR last enjoyed Black’s hospitality on his yacht in early August 1930 with a two-day cruise on Long Island Sound. Two weeks later, a day after visiting FDR in New York, the 55-year-old Black fell overboard while sailing along the Jersey Shore. Governor Roosevelt ordered a search by boat and plane, and even secured a Navy dirigible to look too. It was all futile and Black’s body was never found. Long after his departure from Fidelity, FDR’s desk remained in use in the New York and Baltimore offices even as the company was acquired by the Zurich American Insurance Company in 1980. In honor of its centenary of doing business in the United States, Zurich gave the desk to the Franklin D. Roosevelt Presidential Library in 2012. 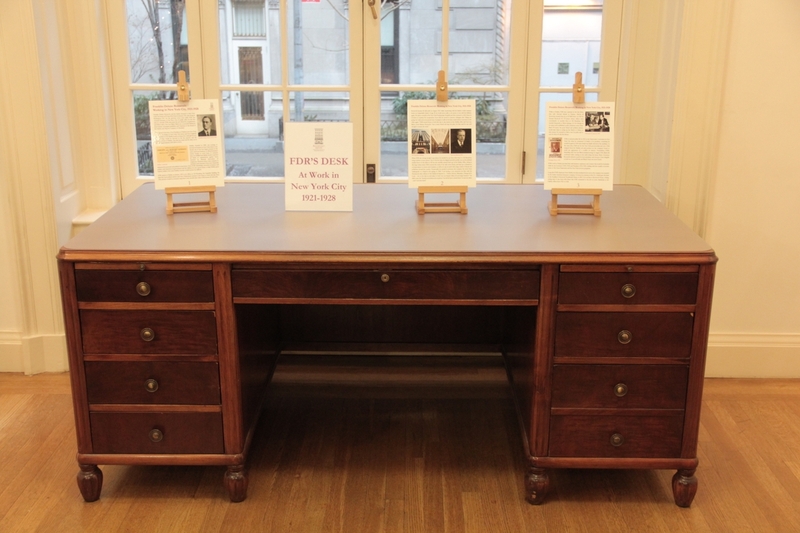 The Library has generously loaned the desk for display at Roosevelt House, a fitting setting since it was from 65th Street that FDR commuted to his job in Lower Manhattan at the Fidelity offices from 1921 to 1928. Deborah S. Gardner, Roosevelt House at Hunter College: the story of Franklin and Eleanor’s New York City Home (New York: Gilder Lehrman Institute of American History and Hunter College, 2009). Langdon Parker Marvin, Reminiscences of Langdon Parker Marvin and Mary Vaughan Marvin, Columbia University Oral History, 1949. New York City Landmarks Preservation Commission, “Equitable Building Designation Report,” June 25, 1996, available at http://www.nyc.gov/html/lpc/downloads/pdf/reports/equitable.pdf . New York Times, provided by Proquest Historical Newspapers at the Hunter College Library. Eleanor Roosevelt, The Autobiography of Eleanor Roosevelt (New York: Harper Collins, 1961). David W. Rose, “Friends and Partners: The Legacy of Franklin D. Roosevelt and Basil O’Connor in the History of Polio,” unpublished paper, 2013. Turnley Walker, Roosevelt and the Warm Springs Story (New York: A.A. Wyn, Inc., 1953). Zurich American Insurance Company, historical materials provided 2012. Many thanks to the Franklin D. Roosevelt Presidential Library for the loan of the desk. Out of office, FDR takes a job in New York. Given FDR's friendships, networks, and experience, he helped Fidelity grow. FDR contracts polio and never walks again, but remains optimistic. FDR returns to work at Fidelity, overcoming his physical challenges. FDR re-enters public life and runs successfully for office in 1928. FDR's desk is rediscovered, bringing to light his work in the 1920's.